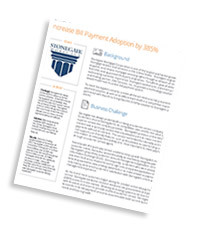 Stonegate’s previous online bill payment solution was a quick-pay service that only allowed users to make one-time payments without enrollment. After evaluating the available EBPP solutions in the market, Stonegate chose Alacriti’s OrbiPay solution for its comprehensive, user-friendly features. Since the OrbiPay implementation in November of 2012, Stonegate’s online payment transactions have grown in number from 4,500 to over 22,000, and payment volumes overall have grown from 6 million to over 30 million. Stonegate attributes this significant increase in usage – along with improved customer satisfaction – to OrbiPay’s ease of use, comprehensive features, and seamless integration with Stonegate’s customer-facing application.